Back when I was living in New York, the Oscars were a big annual event that brought together friends and coworkers. 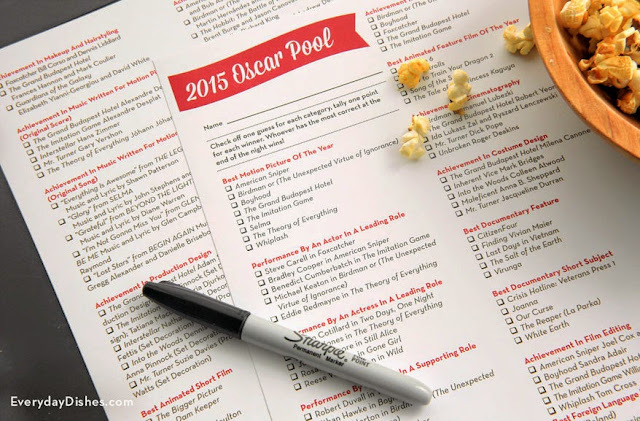 Year after year, I was the designated organizer for the office Oscar pool, and I would spent that one Sunday night at home watching the ceremony while scoring the ballot sheets. I would announce the results in the pantry the following morning, and the lucky winner would use part of his or her winnings to buy coffee for everybody. 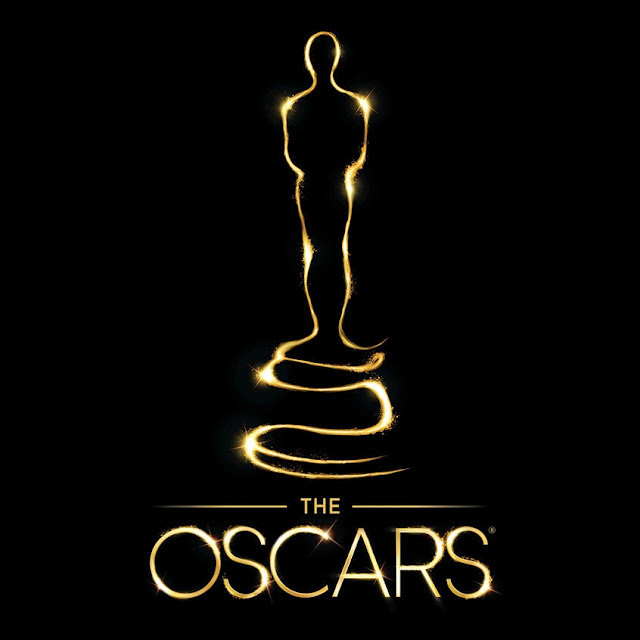 Luck plays a big role in Oscar pools because few people have the time or care to watch all the nominated films. Besides, doing so doesn’t necessarily increase – and can sometimes even lower – one’s chance of winning. As former Pool Master and now a movie reviewer, however, I feel duty-bound to do my due diligence and watch at least every Best Picture nominee before Oscar night. But it is no easy feat, as the number of nominees has nearly doubled from five in the pre-2009 era to nearly 10 ever since. What’s more, Hollywood studios are known to withhold critically acclaimed films until just a few weeks before the awards night to keep them fresh on the judges’ minds, resulting in a last minute rush of new releases in late January and early February. Doing Oscar due diligence is even more challenging after I left New York. Here in Hong Kong, cinemas are dominated by the likes of Spider-man 2 and Hangover 3 during the Oscar season (which coincides with Chinese New Year), and artsy films invariably get pushed back to March and April. Many low-budget independent films do not get screened at all. I did manage to watch all eight Best Picture nominees this year, but not without a struggle. For instance, The Imitation Game opens in Hong Kong only this coming Thursday and Selma isn’t released until mid-March. I had to catch both of them in Europe during my Chinese New Year break. And I’m glad I did, as this year’s line-up is one of the strongest in recent years. The eight contenders in the Best Picture category are as well-made as they are diverse. They run the gamut of war drama (American Sniper), biopics (The Imitation Game and The Theory of Everything), bildungsroman (Boyhood) and comedy-thriller (The Grand Budapest Hotel). My top pick was Boyhood, a critical look at the American life mired in existential crises. The camera followed the cast for 12 years, telling the coming-of-age story of a boy as he quite literally ages in front of the audience. The film deserves a win for both its depth and innovative storytelling. In the end, the Best Picture went to Birdman (or The Unexpected Virtue of Ignorance), a meta-narrative about the entertainment industry written and directed by Mexican filmmaker Alejandro González Iñárritu. That means I probably would have lost this year’s Oscar pool if I had organized one. 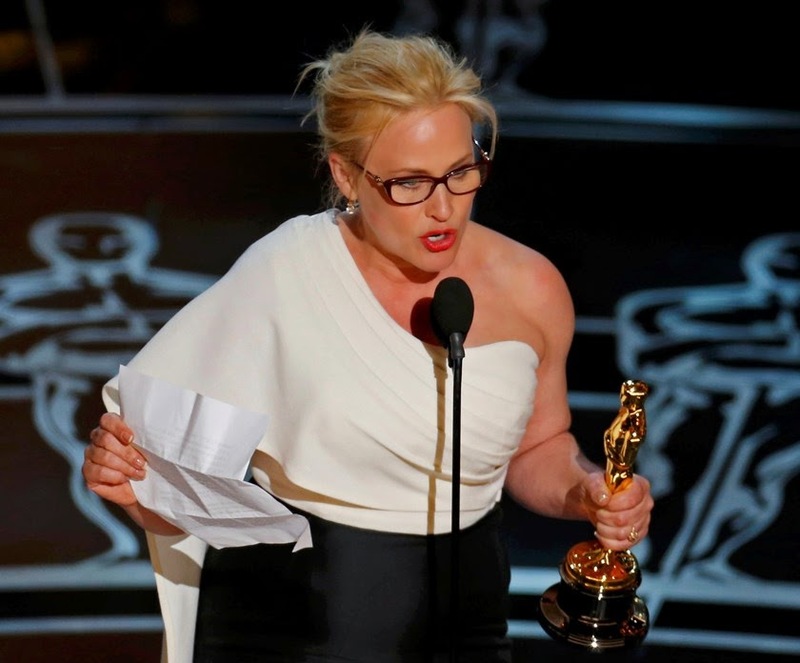 Indeed, the Academy Awards are known for their unpredictability. Over the years, the red carpet has been littered with terrible wins and surprising snubs. Shakespeare in Love and Crash are two of the weakest Best Picture winners in history, as are Russell Crowe’s back-to-back duds: The Gladiator and A Beautiful Mind. Then there were egregious misses like Citizen Kane, The Graduate and Pulp Fiction. Much of it has to do with the non-transparent and decidedly undemocratic voting process. Winners are handpicked by a 5,800-member committee in a “small circle election” not unlike the one that elects our chief executives. No one outside the Academy knows who these members are or how they are selected. What we do know is that they are industry insiders who tend to be swayed more by Hollywood politics than the merit of individual films or performances, and that they have a soft spot for historical melodramas and actors portraying serial killers, deranged psychos and the terminally ill. I also have a bone to pick with some of the award categories. For starters, I never understand the distinction between Best Picture and Best Director – I would think one should always go with the other. But because they are two separate awards, the latter has become a silver medal of sorts. 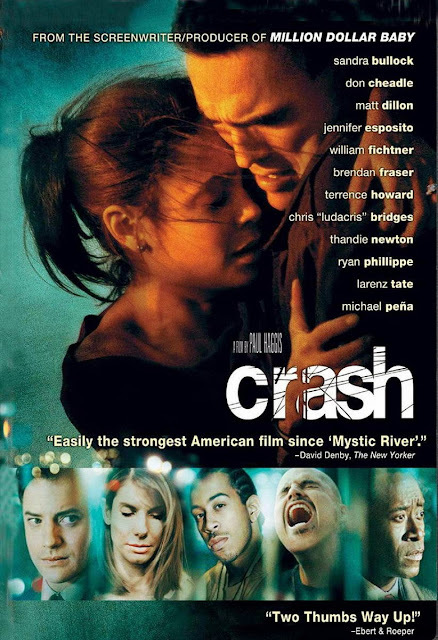 For instance, when Brokeback Mountain lost to Crash in 2005, Ang Lee was given a golden statuette for his directing as a consolation prize. Perhaps even more arbitrary is the distinction between men and women for the lead and supporting roles. Why draw a line between genders but not across races or religions? Separating actors from actresses is to suggest that the two groups cannot or should not compete together, like male and female athletes who must play in their own leagues. They say the Oscars are a load of self-congratulatory kitsch, a night in which overpaid celebrities in tuxedos and designer gowns give each other high-fives for being famous and fabulous. The ceremony can run well over four hours, strung together by lame jokes, tedious monologues and acceptance speeches that are far too long and peppered with names known only to the people uttering them. Perhaps that’s why viewership has been on the decline, until the likeable Ellen DeGeneres brought it back to life last year. At a time when award shows are falling out of favor, the Oscars are coming under increasing pressure to reinvent itself or risk losing its relevance and going the way of beauty pageants and variety shows. 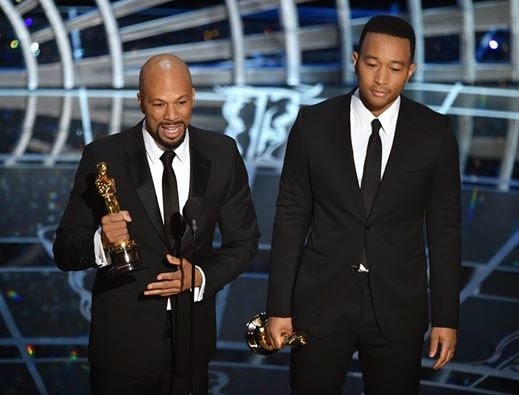 But every once in a while, when we least suspect it, someone will walk up the stage and take our breath away – such as when rapper Common and singer/songwriter John Legend gave a shout out to Hong Kong in their acceptance speech at this year’s Oscars. The winners of Best Original Song declared that the spirit of the Edmund Pettus Bridge in Selma, Alabama – the site for one of the defining chapters in the Civil Rights Movement – now connects inner-city children in America to the Charlie Hebdo victims, and to the student protestors in our very own Umbrella Movement. Those simple yet powerful words touched millions of viewers in this part of the world, and in so doing, made the Academy Awards just a little more relevant. 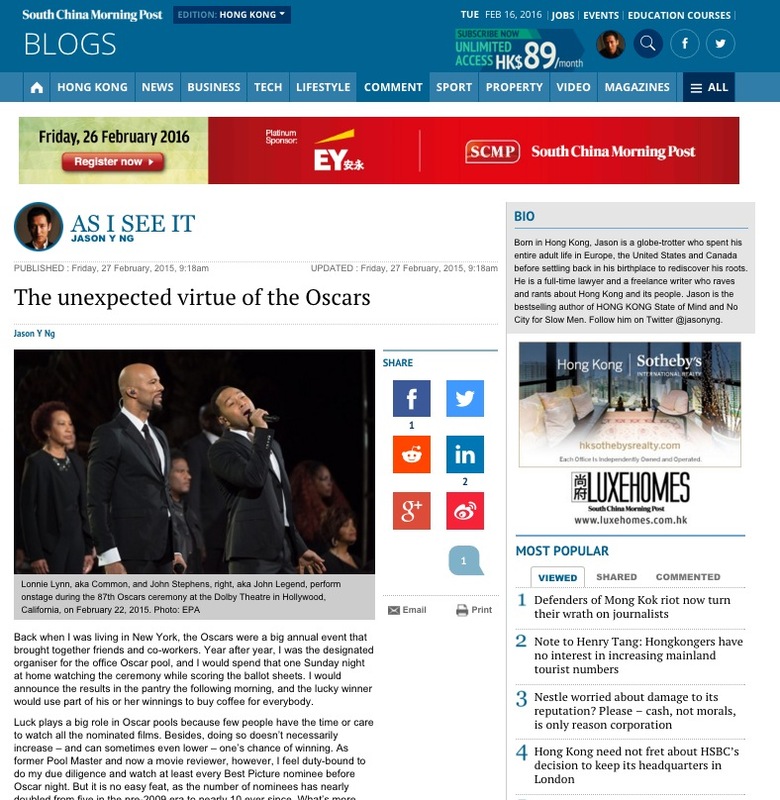 This article was published in the South China Morning Post under "The unexpected virtue of the Oscars."